Remember the T-shirts? “Seattle Rain Festival: January through December.” Ha! We are indeed blessed with abundant water and a green environment, but all this rain also creates problems. During heavy rains, our storm water system overflows, and combined sewer overflows pollute our precious Puget Sound. Fortunately, there’s something homeowners can do to help out: Get RainWise! In many areas of Seattle including Ballard, property owners can get beautiful and functional landscaping, and store rain water for watering gardens, with up to 100% of the cost paid by a rebate from the City of Seattle or King County. Really! RainWise is worth jumping up and down about! Why Get a Rain Garden and/or Cistern(s)? WE HAVE A SERIOUS PROBLEM WITH STORM WATER RUNOFF. When it rains, runoff flows from impervious surfaces like roofs and streets, carrying oil, fertilizers, pesticides, sediment and other pollutants downstream. Storm water is the #1 polluter of Puget Sound. The problem is made worse in Seattle, where our antiquated sewage system combines storm water and raw sewage in one pipe. During a hard rain, this mixture of toxic runoff and raw sewage is too much for our sewage treatment plants to handle, and the excess is dumped directly into the Sound. Overflows happen an average of 318 times per year. Each year, million gallons of untreated sewage and toxic storm water flows into our lakes, streams, and Puget Sound. This damages water resources and harms aquatic life. YOU Can Be a Part of the Solution: Get RainWise! PROPERTY OWNERS WITH RAIN GARDENS AND/OR CISTERN(S) ARE MANAGING STORM WATER AT HOME – AND RAINWISE REBATES ARE HERE TO HELP. A rain garden acts like a native forest by collecting, absorbing, and filtering storm water runoff from rooftops. Rain gardens are beautiful landscape features built with soil mixes that absorb water quickly and support healthy plant growth. They can be shaped to fit your yard and can be planted with a variety of plants to fit your landscape, including edibles. Cisterns are above-ground tanks that capture rainwater from your roof. During the winter, they collect rain and slowly release it to the sewer system. In the summer, you can store rain water for use in your gardens! 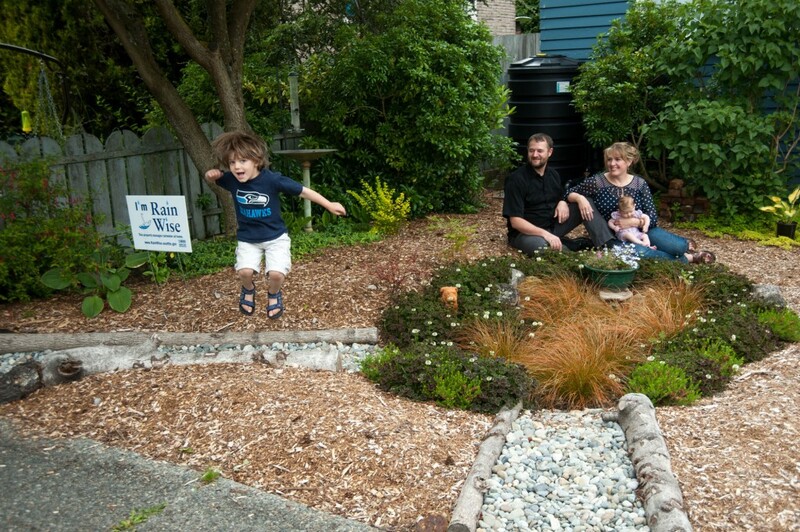 RainWise will rebates average 90% of the cost of installing a rain garden and/or cistern(s). The average RainWise rebate is $4,800. • Choose a contractor – Get a consultation to find out what’s possible on your property! • Check out stories of RainWise neighbors! Seattle Public Utilities launched the RainWise program in 2011, with Ballard as the first eligible drainage basin – not because of Ballard’s environmental awareness or activism, but rather because the stormwater overflows to Salmon Bay were happening more frequently than anywhere else in Seattle! In 2012, SPU approached Sustainable Ballard about developing outreach strategies for RainWise, given of our experience activating neighbors to take positive action. Our small team started designing, implementing and field-testing outreach strategies, with such success that as the program has grown over the years, the City of Seattle and King County have contracted with us to do outreach for RainWise in all 19 rebate-eligible basins in Seattle.